One of the biggest unfunded risks for retirees in the United States is long-term care. The reality is that this is a risk for most retirees – as nearly 70 percent of people age 65 will need some form of long-term care during their lives. However, there is a big disconnect between this risk and planning. In a recent research study conducted by The American College, only roughly one-third of the respondents age 60 to 75 said they have any long-term care plan in place, leaving many at risk of running out of money in retirement or not receiving the quality of care they might want. What people need (and advisors should provide) is a plan for long-term care. Often when people hear the term long-term care, they immediately think about insurance or a nursing home. In reality, long-term care planning is much more than just those two pieces. It’s about funding the risk, controlling the type of care, determining where care will be provided and giving family members permission to act. Long-term care planning needs to be a constant piece of any financial planning process. While many individuals won’t have a long-term care plan in place early on in their lives, you should help them start thinking about the topic sooner than later. Advisors often put off bringing up long-term care because people don’t like talking about end-of-life issues such as mortality and declining quality of life (just like advisors don’t like discussing succession planning). Bringing the conversation up early can help break down the hesitancy to discuss the topic. Eventually, long-term care planning needs to be its own focused endeavor. It should be coordinated with the overall retirement income plan and not just be an afterthought or throwaway item. Cover topics like the costs, location of care and ways to fund it. Generally, most long-term care starts in the home and then may progress until the individual needs institutional care. According to some research, roughly 65 percent of retirees who need long-term care will use home care for an average of two years. Most of this care is unpaid and provided by family members – the most common long-term care situation. Every plan should address this possibility and involve the family member or members most likely to provide care – the spouse and/or children in most situations. The caregiving responsibility can be a lot of work – both physically and emotionally – and it can impact the financial wellbeing of the caregiver. With that in mind, it’s crucial a plan is developed ahead of time and incorporates the family caregiver. This way they’re aware of the individual’s desired level and type of care. A plan can also provide the family caregiver with funding, guidance on care and permission to get additional help when needed. When it comes to financing long-term care, consider the options. Long-term care insurance is designed specifically to cover long-term care costs. Consider discussing this before retirement, as the percent of long-term care applicants who are denied insurability doubles from age 50 to 70. If long-term care insurance isn’t possible, there are also hybrid-insurance policies that marry together life insurance or an annuity with a long-term care feature. These policies have grown in popularity in recent years as they offer flexibility traditional long-term care policies don’t always offer. Furthermore, an individual can self-fund the expenses without using an insurance product. This could be through tapping into retirement accounts like IRAs or 401(k) plans, or by strategically using home equity. When looking at home equity, a reverse mortgage could help create a cash flow stream in order to provide for home care support. In other cases, the home might be sold to provide the cash required to move into a nursing home, continued care retirement community or assisted living facility. Additionally, financing strategies don’t have to be all or nothing. Consider diversifying funding options. Perhaps you buy a basic long-term care insurance policy that focuses more on long-term institutional care in order to keep your premiums down. Then you can also layer on a life insurance policy with a life insurance rider to provide some additional flexibility on funding in case you need more money. If you don’t need additional care, you still have a death benefit for your estate. You can also set up a reverse mortgage line of credit to draw from to support at-home care. If the line of credit ends up unused, the home equity is still protected. Lastly, Medicaid is a funding option for many, but qualifying typically requires spending down assets first, so not a great strategy to push when you’re marketing your firm. Long-term care planning is like the name says: long. It should start at an early age with conversations that raise awareness of the issue and the planning required. The family should be involved with the planning in many situations. It’s important to give potential family caregivers a framework for care, support and permission to get assistance. Funding is also crucial as long-term care can be expensive. But remember, most care is at home – so don’t ignore strategies that can help support care in the home. Strategies can be mixed together. A long-term care plan should never be an all or nothing plan – it should be collaborative and coordinated with the overall retirement income plan. 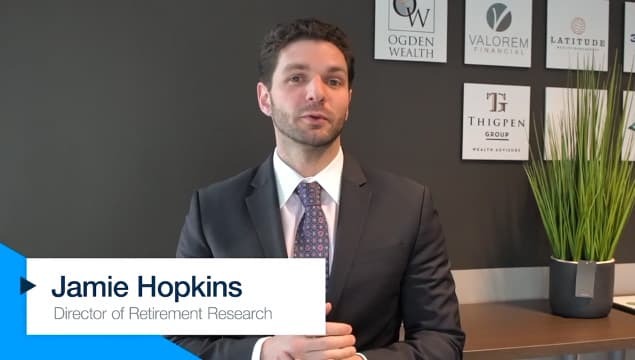 Jamie Hopkins, Esq., is the Director of Retirement Research at Carson Wealth and a former professor of Taxation at The American College, where he helped co-create the Retirement Income Certified Professional) education program. His most recent book, "Rewirement: Rewiring The Way You Think About Retirement," details the behavioral finance issues that hold people back from a more financially secure retirement. He has been selected by InvestmentNews as one of the top 40 financial service professionals under the age of 40 and was also selected by The American Bar Association as one of the top 40 Young Attorneys in the country. In 2017, Trusts & Estates Journal awarded Professor Hopkins the Distinguished Author Award for his article on the Department of Labor Fiduciary Rule. He holds his LLM in Taxation from Temple University School of Law and his J.D. from Villanova University School of Law.